During the two decade we have been serving as a trusted resource and advisor to pharmaceutical, medical device, and biotechnology companies. Through our series of life sciences case studies, we outline some of the actionable results that we have produced for our clients. To read a case study concentrating on the below areas, click on the topic of interest. Objective: Snowfish was asked by a major pharmaceutical company to identify and map KOLs in a particular field of heart disease. They were not satisfied with the traditional approach that relied on traditional literature search and physician surveys. KOL identification and profiling was needed. Snowfish leveraged our proprietary software to filter, sort, and integrate millions of data elements. We also listed the “rising stars” among the KOLs and those KOLs that were considered regional as opposed to national. All results were presented in easy-to-use Excel spreadsheets, with “pull-down” filters to quickly sort or select KOLs based on particular factors (including client sales region). A report of the findings was also presented in PowerPoint format, highlighting all major results. At the final presentation, our team was personally commended by the client’s VP of marketing, and client staff later remarked on both the comprehensiveness of the results and the ease and power of using the deliverables. Objective: An innovative medical device company developed a revolutionary material that literally has hundreds of potential medical applications. Snowfish was asked to provide a strategic product development evaluation for some of the most promising product concepts. The company was relying on the analysis to make multi-million dollar product development decisions. They also needed to compare one product opportunity against another. Snowfish also assigned a relative weighting to each variable that was client driven. Based on the relative weightings, the client was able to get a very clear picture of the market opportunity. This has enabled the company to focus their development efforts and avoid wasting millions of dollars on product concepts that were very unlikely to ever pay off. Snowfish continues to work with the client on multiple projects. Objective: A Snowfish client asked for a quick analysis of the market for a potential innovative medical simulation product. One of the chief constraints on the product’s viability was the number of residents & fellows learning the surgical approach that the product would be simulating. The management team had been told by their board members and KOLs that the product had enormous potential. Snowfish was asked to confirm the assumptions and make a recommendation as to whether the market opportunity merited investment. Methodology: In order to quickly assess the market, Snowfish thought there were two critical elements. The first element was to gain a physician perspective at leading teaching institutions not affiliated with the company to understand the number of physicians that were experienced with the surgical approach. The second element was to see if the procedure volume mirrored the board’s assumptions. Snowfish identified and recruited half a dozen physicians from leading teaching institutions across the United States. We also analyzed procedure volumes based on CPT codes. Results: It quickly became apparent that there was a strong match between what we were hearing from non company affiliated physicians and the CPT codes. In fact, both data elements were in complete agreement. They both indicated that there was not a market for the medical simulation product. Based on these two strong data points, Snowfish recommended that the company should not pursue the product development. 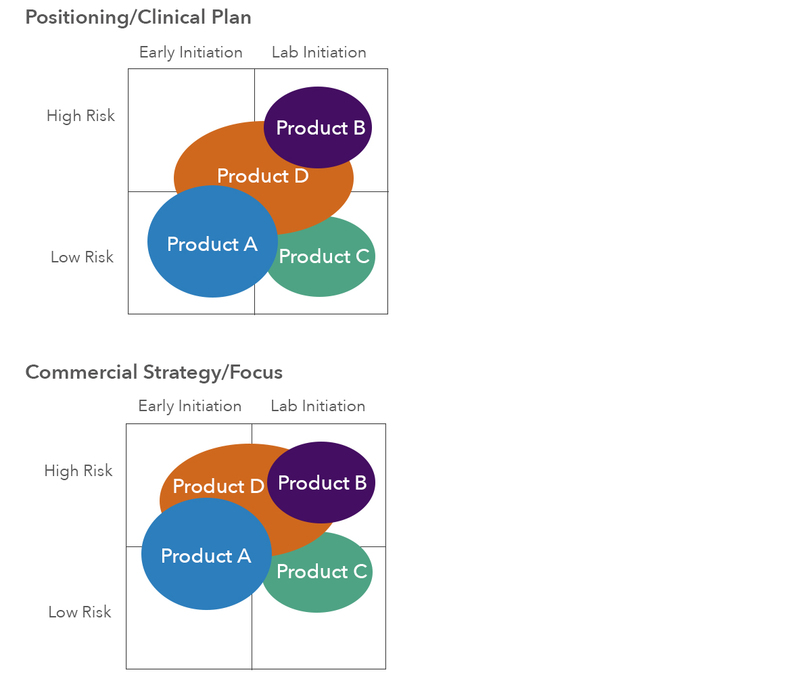 The images below were part of an in-depth client presentation on the current competitive landscape, and the likely impact of ongoing trials that might affect the product’s future. The competitive analysis was based on ongoing trials, expected data and anticipated positioning. Our analysis enabled our client to take steps as early as possible, to achieve more effective positioning of their product. Continue efforts to expand use upstream in AMI patients planned for angioplasty. New indication for PCI. Promote efficacy of treatment regimen in both UA/NSTEMI and STEMI patients undergoing PCI. Leverage data from their large clinical trial along with other data in STEMI. May be pushing to continue to capture patients eligible for early administration of eptifibatide. May position as optimal GP IIb/IIIa inhibitor to be used with early invasive strategy. Depending upon what the trial shows, focus may be on either replacing heparin or GP IIb/IIIa inhibitors in upstream management of UA/NSTEMI patients. Focus of strategy and indication will depend upon the results. May leverage additional trial results to support role of high-dose clopidogrel in a new standard of care, however may still promote benefit of the high-dose without the need for the addition of a GP IIb/IIIa inhibitor. Objective: A top 10 pharmaceutical company currently marketing billions of dollars worth of products in a specific disease state area made the strategic decision to significantly increase collaboration with academic and research institutions. The purpose was to partner with institutions on early-stage research, turn it into clinical stage and eventually commercial products. Snowfish was tasked with identifying academic and research centers of excellence for the purpose of fostering long-term strategic relationships. A tremendous amount of data was analyzed. The client needed to go beyond the “usual suspects” and ensure that the goals and objectives of the centers of excellence are aligned with the company. Once we were able to identify our “short-list”, we conducted one-on-one in-depth interviews with key individuals within the organizations to detail their profile and offer our client everything they needed to know so that they could have a very fruitful initial meeting. Results: Snowfish was able to narrow a tremendous number of organizations to the top 30 or the top 99.6% percentile. Very specific details about their organization including staff, research, goals, interests and aspirations were provided in a user-friendly format. Our client now has everything they need for senior management to make informed decisions on which organizations with whom to take the first step and how best to maximize the efficiencies of their initial meeting.